Hero MotoCorp, among India’s leading sponsors in sports, are strengthening their ties with cricket after a five-year hiatus. India’s leading two-wheeler manufacturer is one of the nine sponsorship brands for the Asia Cup cricket championship, starting in Dubai today (Saturday). Hero has inked the Asia Cup sponsorship deal close on the heels of announcing Virat Kohli as the company’s brand ambassador. Hero MotoCorp had snapped its brand endorsement ties with cricket following the 2013 Indian Premier League. UAE-based global financial services brand Unimoni has come on board as the title sponsor of the 14th edition of Asia’s coveted six-nation men’s cricket tournament, ending the reign of popular Indian smartphone brand Micromax, which has been the title sponsor for the Asian Cricket Council regional limited overs competition since 2010. 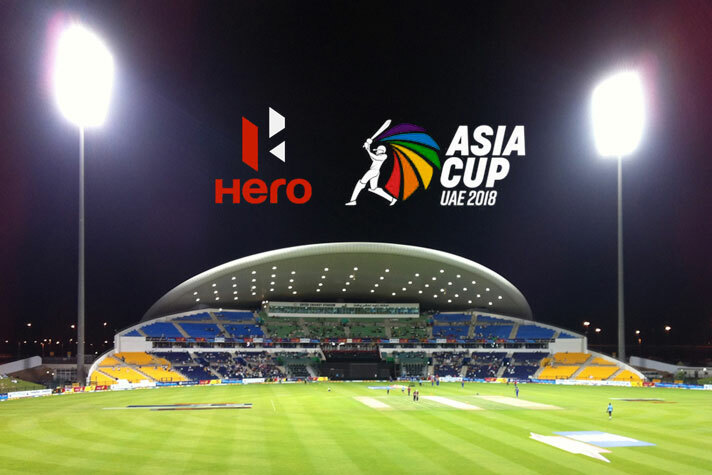 Micromax has sponsored three edition of Asia Cup since 2010 except the one in 2014 during which consumer electronics manufacturer Arise held the title rights of the competition. Unimoni, which is also the official broadcast sponsors of Asia Cup 2018, is the rebranded business of Dubai-based company UAE Exchange, a move that was taken this year with the aim of enhancing and strengthening the company’s global presence and provide a broader spectrum of innovative financial services to its customers. Unimoni India, as part of various activation for Asia Cup 2018, has come up with various exciting contests to leverage from India’s participation and expand its footprints in India. The brand’s campaign and contest ‘#TossKaChamp’, launched on September 1, will take one lucky winner on an all expense paid to the UAE and perform the coin toss at the final on 28 September. Among other premium category sponsors, Seagram’s Royal Stag is offering 100 all-paid tickets for the India Pakistan tie in Dubai to the winners of its “India’s Largest Fan” contest, which is a part of its fan activation campaign. The brand has coming on board as an associate sponsor. Among other brands to join the Asia Cup includes some of the cricket-centric eminent brands such as Edu-tech company Byju’s, Nippon Paints, Haier, Skoda, Dalmia Cement, Netmeds. These brands have established a distinct identity for their persistent and big investments in cricket.